Honda and Toyota reveal new superminis | What Car? Japanese giants Honda and Toyota have revealed supermini concept cars at the Delhi motor show. 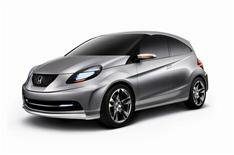 Honda's snappily titled New Small Concept is a low-cost city car expected to go on sale in India and Thailand next year. There are no plans to bring the New Small Concept to Europe, although Honda chief Takanobu Ito did tell us: 'The recession has forced us to revise our business plan, and there is also the matter of exchange rates, so we try to produce locally, that is why the Jazz was moved to the UK. Similarly, Toyota's Etios concept car is virtually production ready the first cars will be built in India at the end of the year. It has been designed specifically for the Indian market and comes with a 1.2 or 1.5 petrol engine. Neither car is being touted as a rival to the ultra-cheap Tata Nano.